Hauoli Makahiki Hou and God Bless to everyone thats been down since jump or just started supporting the Sleepers. We hope and pray for a fruitful and blessed 2012 for us all. Don’t Sleep. Its like Murders Row on Kalakaua! The Homies SLICK & QUEST got down with DEFER (K2S/LA) on the fresh burner to cap off 2011! Big things from Big Time Braddahs, check here for the full run down! I love when genres of music collide it makes for an awesome show, kind of like when i opened for Of Montreal, yah what the heck. 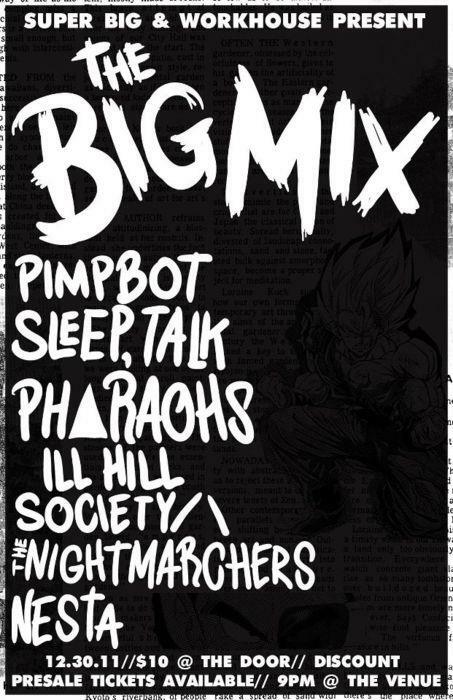 Would love to see Pharaohs rock out! Get yo fix of music at The Venue tonight. BITD – Back in the Day, we made like tracks upon tracks upon tracks. A lot of those tracks was released on cassette and CD’s. Now that there is a new generation and so many means of sharing music on the internet why not crack a few out the vaults and share dem with the people. I like to say that Sentric, is the king of video game beats, b4 Dibiase and possibly Boack’s – Zelda beat. I think he sampled Slime World, but DJ Memoirs hijacked the track recorder and made his own mix down enjoy. Before Woes head back to Hawaii for some R&R he is doing some humanitarian work with his crew Army of Snipers. Check the youtube channel for footy on the tour of tours or Army of Snipers. The homies at Stone Groove will be rocking the spot and highlighted is Grip H album release, “ADHD”. Check the thick line up of performers. Its Free so consider this your pre-New Years pa’ina! Wow, this kid keeps pushing the limits of skateboarding, and now he is landing his tricks even cleaner, im talking “bolts”. The term “bolts” means that when a person lands their tricks both their feet land on the bolts of the board, no toe dragging, and a clean roll away. Most of all he is always having fun, and thats what we about. Enjoy. Mic Phe | Angry Locals | T.K.O. The Angry Locals have been putting in work in 2011 and show they aint stopping entering into 2012. Their final MC battle pitted Mic Phenom vs. T.K.O., its a show stopper. I think the last thing you wanna do is tell TKO he not Hawaiian, chee hoo. Big up to homie Mic Phe. Check out www.angrylocals.com for more videos of that night and their merch.